"PETE" redirects here. For other uses of "PET", see PET (disambiguation). For other uses, see Pete (disambiguation). Polyethylene terephthalate (sometimes written poly(ethylene terephthalate)), commonly abbreviated PET, PETE, or the obsolete PETP or PET-P, is the most common thermoplastic polymer resin of the polyester family and is used in fibres for clothing, containers for liquids and foods, thermoforming for manufacturing, and in combination with glass fibre for engineering resins. It may also be referred to by the brand names Terylene in the UK, Lavsan in Russia and the former Soviet Union, and Dacron in the US. The majority of the world's PET production is for synthetic fibres (in excess of 60%), with bottle production accounting for about 30% of global demand. In the context of textile applications, PET is referred to by its common name, polyester, whereas the acronym PET is generally used in relation to packaging. Polyester makes up about 18% of world polymer production and is the fourth-most-produced polymer after polyethylene (PE), polypropylene (PP) and polyvinyl chloride (PVC). PET consists of polymerized units of the monomer ethylene terephthalate, with repeating (C10H8O4) units. PET is commonly recycled, and has the number "1" as its resin identification code (RIC). Depending on its processing and thermal history, polyethylene terephthalate may exist both as an amorphous (transparent) and as a semi-crystalline polymer. The semicrystalline material might appear transparent (particle size less than 500 nm) or opaque and white (particle size up to a few micrometers) depending on its crystal structure and particle size. The monomer bis(2-hydroxyethyl) terephthalate can be synthesized by the esterification reaction between terephthalic acid and ethylene glycol with water as a byproduct, or by transesterification reaction between ethylene glycol and dimethyl terephthalate (DMT) with methanol as a byproduct. Polymerization is through a polycondensation reaction of the monomers (done immediately after esterification/transesterification) with water as the byproduct. Plastic bottles made from PET are widely used for soft drinks (see carbonation). For certain specialty bottles, such as those designated for beer containment, PET sandwiches an additional polyvinyl alcohol (PVOH) layer to further reduce its oxygen permeability. Biaxially oriented PET film (often known by one of its trade names, "Mylar") can be aluminized by evaporating a thin film of metal onto it to reduce its permeability, and to make it reflective and opaque (MPET). These properties are useful in many applications, including flexible food packaging and thermal insulation (such as space blankets). Because of its high mechanical strength, PET film is often used in tape applications, such as the carrier for magnetic tape or backing for pressure-sensitive adhesive tapes. Non-oriented PET sheet can be thermoformed to make packaging trays and blister packs. If crystallizable PET is used, the trays can be used for frozen dinners, since they withstand both freezing and oven baking temperatures. Both amorphous PET and BoPET are transparent to the naked eye. Color-conferring dyes can easily be formulated into PET sheet. Terylene (a trademark formed by inversion of (polyeth)ylene ter(ephthalate)) is also spliced into bell rope tops to help prevent wear on the ropes as they pass through the ceiling. PET is used since late 2014 as liner material in type IV composite high pressure gas cylinders. PET works as a much better barrier to oxygen than earlier used (LD)PE. PET is used as a 3D printing filament, as well as in the 3D printing plastic PETG. PET was patented in 1941 by John Rex Whinfield, James Tennant Dickson and their employer the Calico Printers' Association of Manchester, England. E. I. DuPont de Nemours in Delaware, United States, first used the trademark Mylar in June 1951 and received registration of it in 1952. It is still the best-known name used for polyester film. The current owner of the trademark is DuPont Teijin Films US, a partnership with a Japanese company. In the Soviet Union, PET was first manufactured in the laboratories of the Institute of High-Molecular Compounds of the USSR Academy of Sciences in 1949, and its name "Lavsan" is an acronym thereof (лаборатории Института высокомолекулярных соединений Академии наук СССР). 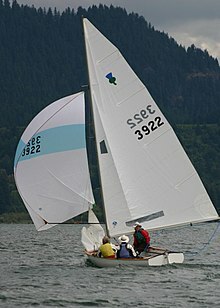 Sailcloth is typically made from PET fibers also known as polyester or under the brand name Dacron; colorful lightweight spinnakers are usually made of nylon. PET in its natural state is a colorless, semi-crystalline resin. Based on how it is processed, PET can be semi-rigid to rigid, and it is very lightweight. It makes a good gas and fair moisture barrier, as well as a good barrier to alcohol (requires additional "barrier" treatment) and solvents. It is strong and impact-resistant. PET becomes white when exposed to chloroform and also certain other chemicals such as toluene. PET is hygroscopic, meaning that it absorbs water from its surroundings. However, when this "damp" PET is then heated, the water hydrolyzes the PET, decreasing its resilience. Thus, before the resin can be processed in a molding machine, it must be dried. Drying is achieved through the use of a desiccant or dryers before the PET is fed into the processing equipment. In some cases, the modified properties of copolymer are more desirable for a particular application. For example, cyclohexane dimethanol (CHDM) can be added to the polymer backbone in place of ethylene glycol. Since this building block is much larger (6 additional carbon atoms) than the ethylene glycol unit it replaces, it does not fit in with the neighboring chains the way an ethylene glycol unit would. This interferes with crystallization and lowers the polymer's melting temperature. In general, such PET is known as PETG or PET-G (Polyethylene terephthalate glycol-modified; Eastman Chemical, SK Chemicals Selenis are some PETG manufacturers). PETG is a clear amorphous thermoplastic that can be injection molded, sheet extruded or extruded as filament for 3D printing. It can be colored during processing. Replacing terephthalic acid (right) with isophthalic acid (center) creates a kink in the PET chain, interfering with crystallization and lowering the polymer's melting point. Such copolymers are advantageous for certain molding applications, such as thermoforming, which is used for example to make tray or blister packaging from co-PET film, or amorphous PET sheet (A-PET/PETA) or PETG sheet. On the other hand, crystallization is important in other applications where mechanical and dimensional stability are important, such as seat belts. For PET bottles, the use of small amounts of isophthalic acid, CHDM, diethylene glycol (DEG) or other comonomers can be useful: if only small amounts of comonomers are used, crystallization is slowed but not prevented entirely. As a result, bottles are obtainable via stretch blow molding ("SBM"), which are both clear and crystalline enough to be an adequate barrier to aromas and even gases, such as carbon dioxide in carbonated beverages. Polyethylene terephthalate is produced from ethylene glycol and dimethyl terephthalate(DMT) (C6H4(CO2CH3)2) or terephthalic acid. In dimethyl terephthalate(DMT) process, this compound and excess ethylene glycol are reacted in the melt at 150–200 °C with a basic catalyst. Methanol (CH3OH) is removed by distillation to drive the reaction forward. Excess ethylene glycol is distilled off at higher temperature with the aid of vacuum. The second transesterification step proceeds at 270–280 °C, with continuous distillation of ethylene glycol as well. PET is subjected to various types of degradations during processing. The main degradations that can occur are hydrolytic, and probably most important, thermal oxidation. When PET degrades, several things happen: discoloration, chain scissions resulting in reduced molecular weight, formation of acetaldehyde, and cross-links ("gel" or "fish-eye" formation). Discoloration is due to the formation of various chromophoric systems following prolonged thermal treatment at elevated temperatures. This becomes a problem when the optical requirements of the polymer are very high, such as in packaging applications. The thermal and thermooxidative degradation results in poor processibility characteristics and performance of the material. Antimony (Sb) is a metalloid element that is used as a catalyst in the form of compounds such as antimony trioxide (Sb2O3) or antimony triacetate in the production of PET. After manufacturing, a detectable amount of antimony can be found on the surface of the product. This residue can be removed with washing. Antimony also remains in the material itself and can, thus, migrate out into food and drinks. Exposing PET to boiling or microwaving can increase the levels of antimony significantly, possibly above USEPA maximum contamination levels. The drinking water limit assessed by WHO is 20 parts per billion (WHO, 2003), and the drinking water limit in the United States is 6 parts per billion. Although antimony trioxide is of low toxicity when taken orally, its presence is still of concern. The Swiss Federal Office of Public Health investigated the amount of antimony migration, comparing waters bottled in PET and glass: The antimony concentrations of the water in PET bottles were higher, but still well below the allowed maximum concentration. The Swiss Federal Office of Public Health concluded that small amounts of antimony migrate from the PET into bottled water, but that the health risk of the resulting low concentrations is negligible (1% of the "tolerable daily intake" determined by the WHO). A later (2006) but more widely publicized study found similar amounts of antimony in water in PET bottles. The WHO has published a risk assessment for antimony in drinking water. At least one species of bacterium in the genus Nocardia can degrade PET with an esterase enzyme. Commentary published in Environmental Health Perspectives in April 2010 suggested that PET might yield endocrine disruptors under conditions of common use and recommended research on this topic. Proposed mechanisms include leaching of phthalates as well as leaching of antimony. An article published in Journal of Environmental Monitoring in April 2012 concludes that antimony concentration in deionized water stored in PET bottles stays within EU's acceptable limit even if stored briefly at temperatures up to 60 °C (140 °F), while bottled contents (water or soft drinks) may occasionally exceed the EU limit after less than a year of storage at room temperature. A finished PET drink bottle compared to the preform from which it is made. Worldwide, 480 billion plastic drinking bottles were made in 2016 (and less than half were recycled). In the second step, the preforms are heated rapidly and then inflated against a two-part mold to form them into the final shape of the bottle. Preforms (uninflated bottles) are now also used as robust and unique containers themselves; besides novelty candy, some Red Cross chapters distribute them as part of the Vial of Life program to homeowners to store medical history for emergency responders. In one-step machines, the entire process from raw material to finished container is conducted within one machine, making it especially suitable for molding non-standard shapes (custom molding), including jars, flat oval, flask shapes, etc. Its greatest merit is the reduction in space, product handling and energy, and far higher visual quality than can be achieved by the two-step system. In 2016, it was estimated that 56 million tons of PET are produced each year. While most thermoplastics can, in principle, be recycled, PET bottle recycling is more practical than many other plastic applications because of the high value of the resin and the almost exclusive use of PET for widely used water and carbonated soft drink bottling. PET has a resin identification code of 1. The prime uses for recycled PET are polyester fiber, strapping, and non-food containers. PET, like many plastics, is also an excellent candidate for thermal disposal (incineration), as it is composed of carbon, hydrogen, and oxygen, with only trace amounts of catalyst elements (but no sulfur). PET has the energy content of soft coal. The high plasticization temperature of PET in the range of 280 °C (536 °F) is the reason why almost all common organic impurities such as PVC, PLA, polyolefin, chemical wood-pulp and paper fibers, polyvinyl acetate, melt adhesive, coloring agents, sugar, and protein residues are transformed into colored degradation products that, in their turn, might release in addition reactive degradation products. [clarification needed] Then, the number of defects in the polymer chain increases considerably. The particle size distribution of impurities is very wide, the big particles of 60–1000 µm—which are visible by naked eye and easy to filter—representing the lesser evil, since their total surface is relatively small and the degradation speed is therefore lower. The influence of the microscopic particles, which—because they are many—increase the frequency of defects in the polymer, is relatively greater. The motto "What the eye does not see the heart cannot grieve over" is considered to be very important in many recycling processes. Therefore, besides efficient sorting, the removal of visible impurity particles by melt filtration processes plays a particular part in this case. Workers sort an incoming stream of various plastics, mixed with some pieces of un-recyclable litter. Bales of crushed blue PET bottles. Bales of crushed PET bottles sorted according to color: green, transparent, and blue. In general, one can say that the processes to make PET bottle flakes from collected bottles are as versatile as the different waste streams are different in their composition and quality. In view of technology there isn't just one way to do it. Meanwhile, there are many engineering companies that are offering flake production plants and components, and it is difficult to decide for one or other plant design. Nevertheless, there are processes that are sharing most of these principles. Depending on composition and impurity level of input material, the general following process steps are applied. The recycling of PET bottles is meanwhile an industrial standard process that is offered by a wide variety of engineering companies. The fact that some machine manufacturers and line builders in Europe and the United States make efforts to offer independent recycling processes, e.g. the so-called bottle-to-bottle (B-2-B) process, such as BePET, Starlinger, URRC or BÜHLER, aims at generally furnishing proof of the "existence" of the required extraction residues and of the removal of model contaminants according to FDA applying the so-called challenge test, which is necessary for the application of the treated polyester in the food sector. Besides this process approval it is nevertheless necessary that any user of such processes has to constantly check the FDA limits for the raw materials manufactured by themselves for their process. Methanolysis is only rarely carried out in industry today because polyester production based on dimethyl terephthalate(DMT) has shrunk tremendously, and many dimethyl terephthalate (DMT) producers have disappeared. ^ a b c d e f g h van der Vegt, A. K.; Govaert, L. E. (2005). Polymeren, van keten tot kunstof. VSSD. ISBN 9071301486. ^ a b c Record of Polyethylenterephthalat in the GESTIS Substance Database of the Institute for Occupational Safety and Health, accessed on 7 November 2007. ^ a b Speight, J. G.; Lange, Norbert Adolph (2005). McGraw-Hill (ed.). Lange's Handbook of Chemistry (16th ed.). pp. 2807–2758. ISBN 0-07-143220-5. ^ Ji, Li Na (June 2013). "Study on Preparation Process and Properties of Polyethylene Terephthalate (PET)". Applied Mechanics and Materials. 312: 406–410. doi:10.4028/www.scientific.net/AMM.312.406. ^ SIPA: Lightweight compressed gas cylinders have plastic liners / PET provides high oxygen barrier https://www.plasteurope.com, 18 November 2014, retrieved 16 May 2017. ^ TEIJIN: Trademarks "Mylar and Melinex are the registered trademarks or trademarks of Dupont Teijin Films U.S. Limited Partnership and have been licensed to Teijin DuPont Films Japan Limited"
^ Ryazanova-Clarke, Larissa; Wade, Terence (31 January 2002). The Russian Language Today. Taylor & Francis. pp. 49–. ISBN 978-0-203-06587-7. ^ Gupta, V.B. and Bashir, Z. (2002) Chapter 7, p. 320 in Fakirov, Stoyko (ed.) Handbook of Thermoplastic Polyesters, Wiley-VCH, Weinheim, ISBN 3-527-30113-5. ^ Cheng, X.; et al. (2010). "Assessment of metal contaminations leaching out from recycling plastic bottles upon treatments". Environmental science and pollution research international. 17 (7): 1323–30. doi:10.1007/s11356-010-0312-4. PMID 20309737. ^ Shotyk, William; et al. (2006). "Contamination of Canadian and European bottled waters with antimony from PET containers". Journal of Environmental Monitoring. 8 (2): 288–92. doi:10.1039/b517844b. PMID 16470261. ^ Hansen, Claus; et al. (2010). "Elevated antimony concentrations in commercial juices". Journal of Environmental Monitoring. 12 (4): 822–4. doi:10.1039/b926551a. PMID 20383361. ^ Borland, Sophie (1 March 2010). "Fruit juice cancer warning as scientists find harmful chemical in 16 drinks". Daily Mail. ^ Sharon, Chetna; Sharon, Madhuri (2012). "Studies on Biodegradation of Polyethylene terephthalate: A synthetic polymer" (PDF). Journal of Microbiology and Biotechnology Research. 2 (2): 248–257. ^ Yoshida, S.; Hiraga, K.; Takehana, T.; Taniguchi, I.; Yamaji, H.; Maeda, Y.; Toyohara, K.; Miyamoto, K.; Kimura, Y.; Oda, K. (11 March 2016). "A bacterium that degrades and assimilates poly(ethylene terephthalate)". Science. 351 (6278): 1196. doi:10.1126/science.aad6359. PMID 26965627. ^ "Could a new plastic-eating bacteria help combat this pollution scourge?". The Guardian. 10 March 2016. Retrieved 11 March 2016. ^ Sax, Leonard (2010). "Polyethylene Terephthalate May Yield Endocrine Disruptors". Environmental Health Perspectives. 118 (4): 445–8. doi:10.1289/ehp.0901253. PMC 2854718. PMID 20368129. ^ Tukur, Aminu (2012). "PET bottle use patterns and antimony migration into bottled water and soft drinks: the case of British and Nigerian bottles". Journal of Environmental Monitoring. 14 (4): 1236–1246. doi:10.1039/C2EM10917D. ^ Sandra Laville and Matthew Taylor, "A million bottles a minute: world's plastic binge 'as dangerous as climate change'", TheGuardian.com, 28 June 2017 (page visited on 20 July 2017). ^ Saxena, Shalini (19 March 2016). "Newly identified bacteria cleans up common plastic". Ars Technica. Retrieved 21 March 2016. ^ a b "Plastic Packaging Resins" (PDF). American Chemistry Council. Archived from the original (PDF) on 21 July 2011. ^ "Arropol | Arropol Chemicals". Retrieved 2 January 2019. Wikimedia Commons has media related to Polyethylene terephthalate. KenPlas Industry Ltd.: "What is PET (Polyethylene Terephthalate)"
"WAVE Polymer Technology: PET (Polyethylene Terephthalate) flakes processing"